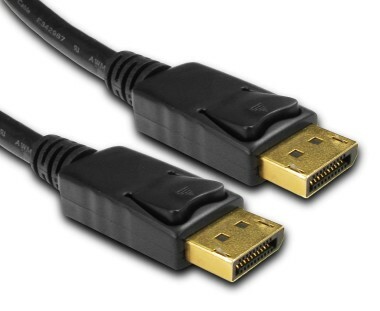 These DisplayPort cables allow you to connect your PC to a monitor where both devices support DisplayPort. See also DP-Mini DP cables. These standard DisplayPort™ (DP) cables are designed to work with any DP Source device such as a PC or laptop, and any DisplayPort monitor. They are compatible with any DisplayPort device, from the very first ones introduced in 2008 through to the newest and future systems that support multi-stream and display resolutions up to 4K (Ultra HD) at 60Hz. You can also use these standard DisplayPort cables between a PC and a multi-stream hub, or between daisy-chainable multi-stream monitors. We recommend that DisplayPort be used in preference to HDMI where possible because DisplayPort supports UHD (Ultra High Definition) video resolutions at 60 Hz. In contrast, most PC implementations of HDMI are based on HDMI version 1.4 which does not support UHD / 4K. The newer HDMI 2.0 standard has yet to see widespread adoption in the PC industry, so if you intend to run UHD at 60 Hz then a DisplayPort connection between your PC and your monitor will be required. Running your PC at a 24 Hz or 30 Hz refresh rate is usually undesirable because it produces jerky mouse pointer movement and a general perception of PC sluggishness. You don’t need to worry about getting a special cable to support certain DisplayPort capabilities. Despite what you may have read elsewhere, there is no such thing as a DisplayPort 1.1 cable or DisplayPort 1.2 cable. All standard DisplayPort cables that we sell will work for any DisplayPort configuration including the new capabilities enabled by DisplayPort 1.2 such as 4K and multi-stream capabilities. Furthermore, all standard DisplayPort cables support RBR (Reduced Bit Rate), HBR (High Bit Rate), and HBR2 (High Bit Rate 2), which can support 4K at 60Hz, or up to four 1080p displays using multi-stream. While other retailers may try to sell you a more expensive cable claiming that it will provide a better picture quality, we are here to debunk that myth. Contrary to what you might think, the more expensive cable will not give you any better picture quality. DisplayPort uses packetised data, similar to USB and Ethernet, to send digital display and audio data, therefore you either get all of the data or you don't. Unlike older video interfaces, you don’t get a “better” picture or any other incremental improvements with a more expensive cable. But of course a poor quality cable could lead to data errors and obvious corruption of the video or audio data, so we would still recommend that you avoid the very cheapest cables. There are two DisplayPort connector types. The standard DisplayPort connector is about the size of a USB connector, and this type is commonly used on DisplayPort-enabled PC monitors and many PC motherboards. The smaller mini DisplayPort connector is commonly used for the DisplayPort outputs on discrete PC graphics cards, especially those with multiple outputs. The cables shown on this page have standard sized DP connectors on both ends. For cables with a standard sized DP connector on one end and a Mini DP connector on the other, please see this page.